If the Teen Choice Awards have taught me anything, it's that today's youth isn't as focused on trends as you'd think. Passing obsessions are one thing, but some artists last forever. Sunday, Britney Spears was named Candies Style Icon at the Teen Choice Awards, and, for the first time, I recognized who was on stage. For a split second, I wondered if this the Style Award was the Teen Choice equivalent of the Lifetime Achievement Award. I'm kidding! The award, which was presented by Fifth Harmony, is about style, and Britney Spears never goes out of that, apparently. It was really cool to see someone who has been with the Teen Choice Awards, since their inception 17 years ago in 1999 getting recognized today. She accepted the award in person with her family in attendance, after a montage of past Spears wins and appearances — including her Ultimate Choice Win in 2009. I wished it had gone on longer! The Teen Choice Awards may be as old as an actual teenager today, but that was a pretty cool throwback. You don't have to be a teenager to like or enjoy these awards, and this Spears tribute proved it. Of course, the pop star, currently thriving in a Vegas residence, showed up to accept the style award in style. Her dress completely turned what I think about lace on its head. 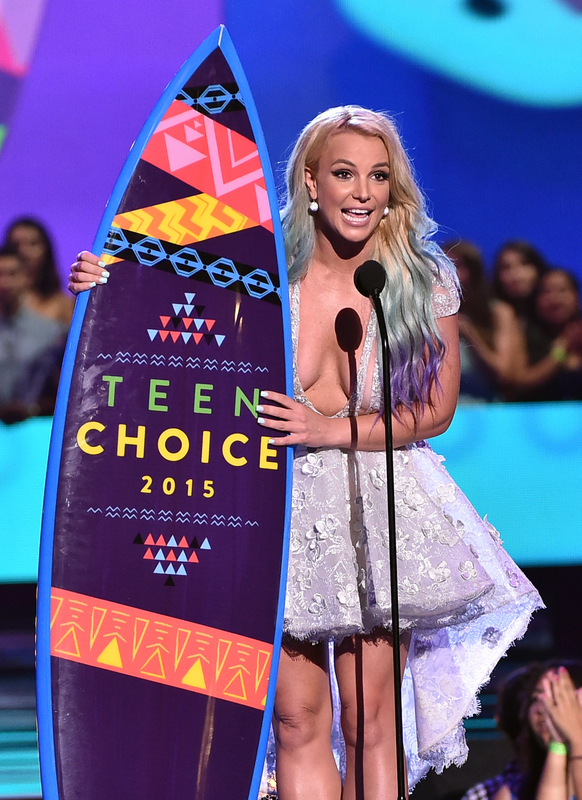 Also, can we talk about Britney Spears' Lisa Frank fairy mermaid ombré? I am in awe of that rainbow perfection. True to her speech, which focused on being and expressing yourself, I love that, with all of Britney Spears' ups and downs, she's not afraid to reinvent her look. "Be fearless in your choices," she said. Amen! Not only that, but Spears stole the stage and showed up all of the young blood in attendance. Don't doubt the Queens, teens.